I apologize in advance for my third (or fourth) straight post about JaDine (James Reid and Nadine Lustre) and their phenomenal primetime show On the Wings of Love, directed by Antoinette Jadaone and Jojo Saguin. Since it aired last August 10, more and more people have become hooked to this series mainly because of the on-screen chemistry of JaDine’s tandem. This is a new territory for the pair as their first collaborations have mostly been related to movies, music and their nationwide concerts. This is also Direk Tonette’s first time to work on a series as opposed to movies. As we all know, filming for a teleserye is much more demanding, and much more challenging as the series needs to sustain viewership on a nightly basis. With their solid following, JaDine had a base to work with but as the weeks went by, the base became stronger as the series delivered on a unique romcom that became the nation’s chill pill after a long day at work. 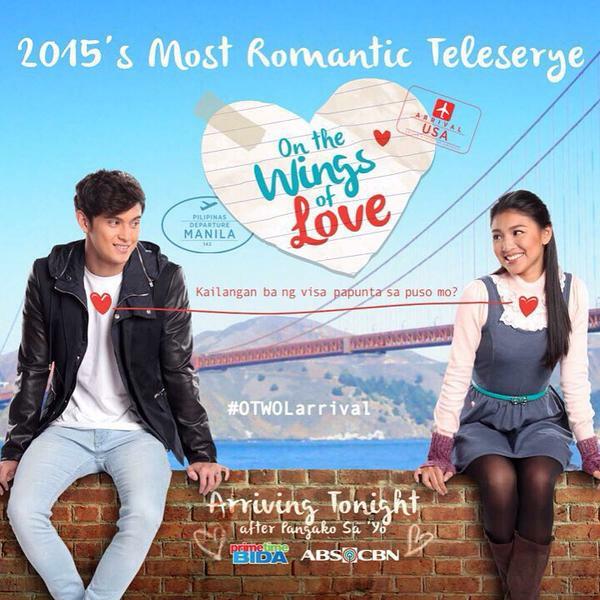 But On the Wings of Love is more than a Kilig-serye. Its something special and as a fan of the tandem and the series, let me outline the reasons why this soap works on so many levels. They could stare at each other for an entire episode and I would still not feel shortchanged. Hugot JaDine. I have a pretty strong feeling that the writers of the show (Benedict Mique and Mariami Tanagco-Domingo) are solid fans of JaDine themselves as they constantly reference significant items and events about the pair since they started 18 months ago. The pepper spray (Peppy, Diary ng Panget), the post it notes (Valentines Day), the top down car (also Valentines), and even the dialogue sometimes have double meaning to address current issues about James Reid and Nadine Lustre. In the episode Selos (Jealousy), Nadine’s character Leah was portrayed as being jealous of James seeing another woman (albeit a client), while in the following episode, The Most Approved Kiss, James’s character Clark was telling Leah that he would never do anything to hurt whatever it is they have. In the same episode, he told Leah that there was no other woman in his life and that he was too busy and only had time for her ‘friendship’. This amid rumors surrounding real life James dating other women and Nadine admitting in a previous interview that she was the jealous type. Art imitating life perhaps? Whatever, the message is not lost on sharp and alert members of the fandom. The chemistry. Now these two have chemistry in spades, perhaps owing to their level of comfort with each other and the fact that they’re truly professionals who do what they’re told without kiyeme, this much their co workers and directors can attest to. They exude a sweetness that does not seem forced or staged and whatever it is that fuels this chemistry adds an intensity to their performances that just keeps getting better as they improve in their craft. Its fun to see them happy and it hurts to see them sad. Such is the connection they have with their audience. In one word, they’re MAGIC. Social commentary on issues affecting OFWs. More than delivering on the kilig, On the Wings of Love is a social commentary about OFWs and their plight. The series tackles issues affecting overseas workers, their problems, their struggles and gives the audience a finer understanding of the sacrifices that these modern heroes make in order to provide for their families. I’m sure that a lot of audiences can relate, especially the TFC audiences. Case in point, Leah’s dilemma in earning cash for her father’s operation, her heartbreak in not being there to support her father in his time of need, Clark’s need to borrow money from a loan shark to support his siblings, Tita Jack’s damaged relationship with Jigs, the Balikbayan box issue. The good thing is that the show gets feedback from the audience adds scenes to flesh out the parts that they want more of in a way that is still not detrimental to the flow of the story. Its about love. Its not just about romantic love. Its about love of a mother and son, love for family, selfish love, selfless love. It just inspires the feels. And directors Antoinette Jadaone and Jojo Saguin truly know how to deliver the feels because they’re master storytellers. Who doesn’t want to see and feel love, right? A stellar cast. The JaDine tandem may be relative newbies to the world of drama but their skills are always tested as they perform scenes with veteran actors Joel Torre, Cherry Pie Picache and Nanette Inventor. Even Bianca Manalo as Manang Tiffany and Nico Antonio as Tolayts are a revelation. Because of the level of talent in this series, everyone is pulling each other up and they all work as a unit. Its no wonder that this series is winning the hearts of the audiences the world over. Its a well made teleserye with substance and a lot of heart. I truly believe that ABS-CBN and Dreamscape made the right call in making the project a vehicle for JaDine. As much as only Enrique Gil and Liza Soberano were meant to bring to life Forevermore, and Daniel Padilla and Kathryn Bernardo were meant to be in Got to Believe, only James and Nadine can pull off On the Wings of Love. I can see no one else doing any better. For more feels, check out this video of Clark and Leah’s Most Approved Kiss Outtake. So cute! 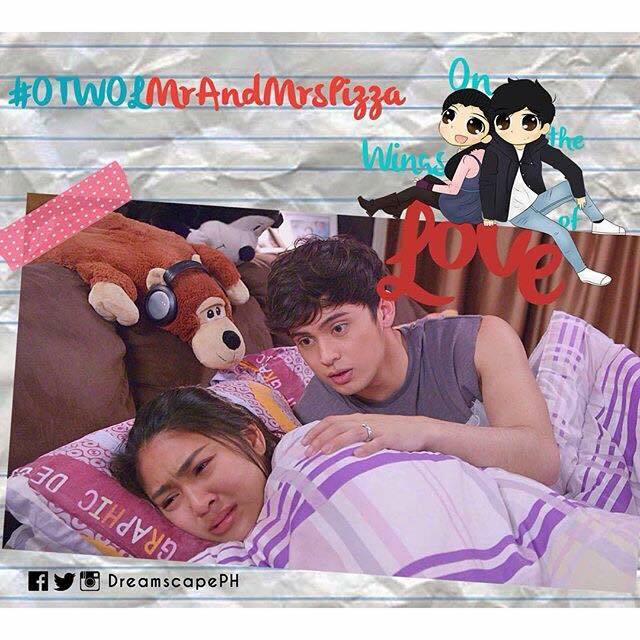 James and Nadine’s first primetime teleserye won the hearts of Pinoys in the Philippines and abroad. More than their chemistry, the relatable real life scenarios offered by the show’s writers and the excellent blend of comedy, romance and drama endeared the show, and its stars to fans for a reason.